. 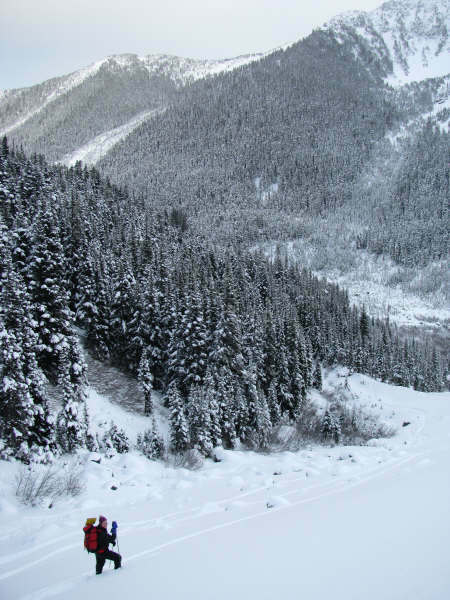 : The Backcountry Bushwack: An Epic Adventure in the BC Wilderness :: Ski XCOttawa.ca :: Skiing in Ottawa and Gatineau Park :. 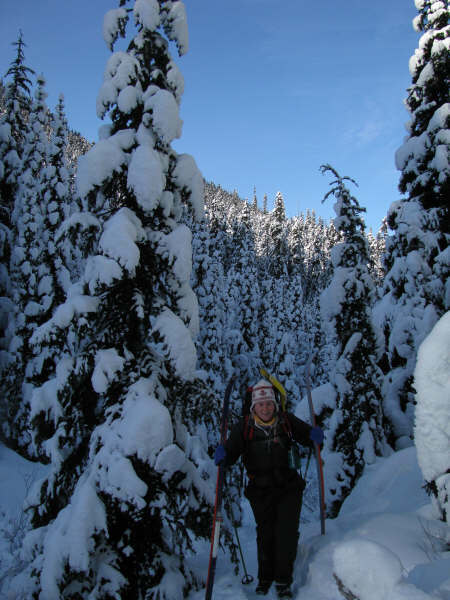 I am by no means a backcountry pro, but I have had my share of adventures in the BC wilderness and would say I am fairly experienced in this setting. The same goes for my friend Sydney although I would say at this point she definitely has more trips under her belt. Syd and I go way back – we’ve been neighbours our entire lives and when your closest (and only) neighbour happens to be the same age, it pretty much guarantees that you will be Best Friends Forever (or BFF’s). Syd and I also ski raced on the same team from Mini-Midget to our current university varsity teams (she UNBC and myself Carleton). During high school we parted ways for school, but we always saw each other at ski races and during the holidays. Anyways, to make a long story short, since we are at nearly opposite ends of the country and living our crazy busy lives, we never see each other anymore, and decided that it was time for a reunion. Now as I’m sure you all know, just because you are neighbours and live a measly 3 km away from each other, this doesn’t make it any easier to meet up. We figured the only way we could guarantee time for each other was if we planned an adventure together. We’ve been adventuring together for the last 15 years – some planned, some not, and each one more hilarious and memorable than the last. This one was no exception. Let me set the scene for you. First of all, British Columbia – there is a reason the license plate reads “Beautiful BC”. Our adventure takes place in the Cerise Creek Alpine Area which is about 1 hour past Whistler – you drive north to Pemberton, then head east through the Duffy Lake Pass, one of the steepest mountain passes in the drive across Canada. Park the car at 4000 ft, and ski up to the cabin which is at approximately 5500ft. In past years this area has been covered under 3 metres of beautiful powder snow, however this year as the snow gods focus their energy on the east coast, they seem to have forgotten entirely about the west, leaving Cerise and area with only about 2.5 – 3 ft of snow tops. This was a bit of an impromptu trip. Although it had been planned for months, the finer details had been left to the morning of since the both of us had just recently returned from school. Both of us had been into Cerise many times before (and have many adventure stories as a result), but we’d never done this together. We figured we’d take our old race skis or maybe our fish scales, gob on some klister and hit the mountain. As for clothing - well obviously long johns, spandex and warm-ups of course. Luckily we were convinced to take some older and hardier skis with skins glued on for grip - after all, the trail did lead straight up the mountain. As for clothing, I’ve never worn so much fleece and long underwear and down all at the same time. I thought I was hardy coming straight from Ottawa where the last Carleton team practice was held at - 30° in Gatineau Park, but apparently BC has a cold edge too, and when we left the car on Saturday morning it was - 25°. We left the parking lot at about 11 am Saturday morning. The trail has been rumoured to be completed in 37 minutes, but of course as ski racers we know that records and PB’s are very subjective as there are many variables in this wintery sport. Lack of snow, unsticky skins, forest detours, spectacular crashes, Kodak moments at every corner and fits of uncontrollable laughter are just some that we had to deal with this weekend. Needless to say, Syd and I did not set any records, and we crawled (quite literally) up to the cabin at 3:15 pm, approximately 4 hours and 15 minutes after we started. All in all we were quite proud of that time, and more importantly just relieved to find the cabin and kick off the skis which were now unwanted. But back to the aforementioned variables. The reason we’d managed to take so long trekking up the mountain started about 30 minutes into our trip. Going up the first really steep part of the trail, Syd’s skins had come off. As soon as the trail flattened out, we stopped to tape them back on, only to realize that her infinite supply of duct tape wrapped around her Nalgene was actually on its last round. When we finished taping up her skis with the meagre supply of tape, we continued on only to have one of my skins come off seconds later. Clearly it was too cold for the glue to keep the skins sticking to the skis. Undeterred, I took off the skin and shoved it in my pocket –we were on a slight downhill and I figured it would be a good time to do some balance work for the next little bit of trail. John and Don (Carleton coaches) would be proud! Not too much later, the second skin came off. Neither of us had bothered to bring wax thinking we’d have the skins on all the way up and then nothing on the way down. Syd was enjoying her skins and we were on a heavily wooded and not very snowy part of the trail, so I decided to walk for a bit. This was fine, until we came out of the woods and into the meadow. 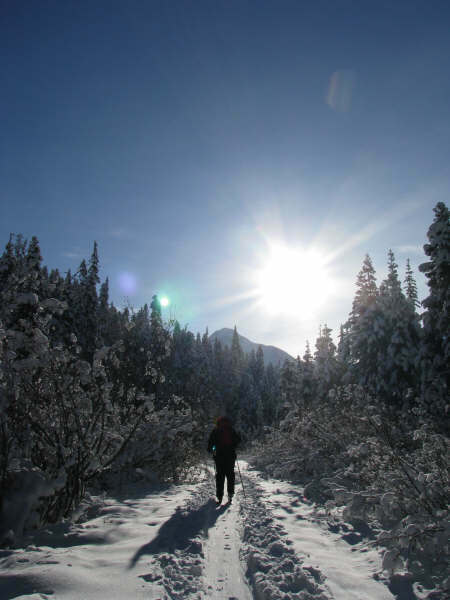 Too much free snow to walk – every step would break through the crust and I’d sink 3 ft deep. This would be a very long trip. 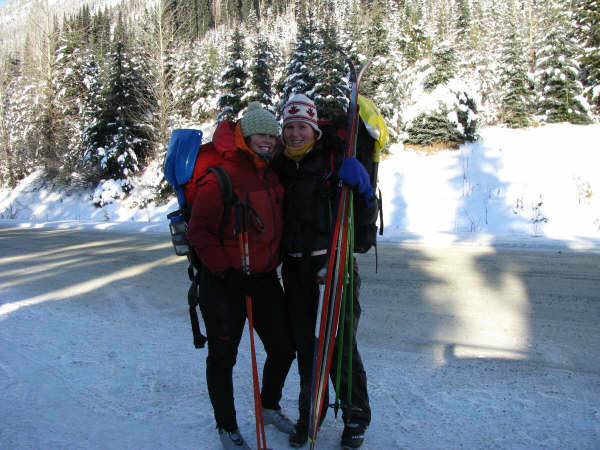 I gave double poling a shot – after poling with old, heavy skis, bamboo poles with large baskets and a 25 lb backpack, I will never again complain during Carleton strength on a perfectly groomed trail with well waxed race skis and poles! Next came the creek section. This part of the trail follows a creek through a ravine alongside a ridge for about an hour (at our pace) switching back and forth across the creek and around boulders until you emerge in a boulder field at the base of the bowl leading to the cabin. This was perhaps the most entertaining part of the trip up, although it really is in close contention with all other sections. Now this may seem mean to other people, but Syd and I have this strange bond which seems to make any misfortune by one of us, absolutely hilarious to the other. In short, I have never laughed so hard or so continuously in my life. However, not to do Syd an injustice, I wasn’t the only one laughing. I was falling just as much and in just as hilarious ways. I realize that it must be a bit difficult for you to understand the situation without having skied the trail, but to give you the jest of it; at this point, Syd and I had one ski with a skin on and one without (to experience the same thing one would have to ski with one skate ski and one klister laden ski at the same time, preferably up a mountain). At the same time we both had heavy backpacks on and were navigating trees, excessive branches (due to lack of snow), boulders and holes all on the side slope of a ravine with a frozen (but still running) creek below. The trail we were following was very narrow with sharp corners and unexpected trees and obstacles, so there were a lot of full body face plants and turtles (where one falls on their back but can’t get up because of their heavy backpack). All of this is very entertaining to watch, but not so fun to have happen to you. However, because we were both falling equally often and in equally awkward and funny ways, we were both in good spirits the whole way up. Now although I mentioned this was probably the most entertaining section of the trail, essentially this was the situation for the entire trip! To our surprise, the normally super popular and super packed cabin was actually empty when we arrived, until our future friends Chris and Hassin showed up 10 minutes later. Fellow avid backcountry skiers, they’d been up on the slopes all day enjoying the powder and checking out the scenery. Over dinner we started chatting (I believe the conversation started when they produced a 4 litre box of wine that they’d carried up!). If you’ve ever stayed in a cabin in the remote backcountry, you will know that there is always a deck of cards in the cabin, and once it gets dark (around 4:30/5 pm) everyone breaks open the deck of cards and you play till bedtime. We decided this would be fun since we now had many more card game options with our two new friends here. After a long and tedious (no offense Hannis!) explanation on an Austrian game called “Moolacheck,” we decided to play poker. Texas Hold’em to be exact. We came up with a system of cards for chips and set to it. Little did we know that it would go on. And on. And on. Till 11 pm to be exact. The game started off nice and relaxed with everyone playing. Slowly Syd and I went out, and then bought (or stole) our way back in, and that’s when the real poker started. After 2 hours it was down to Syd and Chris, both of whom were sporting serious poker faces determined not to lose. After all, the loser would have to get up first and make the coffee the next morning! After 3 hours of trash talking the game finally came to the tipping point. Both went all in, and after a slow and tension-building laying out of the flop, then the turn and finally the river, the hands came down... and Chris won with a king! I believe both Chris and Syd had been bluffing with only a high card. Unfortunately for Syd, hers was only a 10. After a cozy night in the cabin, (I think we all slept well except for Syd who had trouble sleeping after losing the poker match) and an early rising to make the coffee, Syd and I packed up our gear. We wanted a relatively early start on the trek out as we knew the lack of snow would make going out just as slow as coming in, although it would probably be considerably more dangerous. We took the skins off the remaining skis – we were seasoned racers, we didn’t need skins going down - and said goodbye to our new friends even though we were pretty certain we would be seeing them again as they caught us on the way down. We thought the trip in was epic. Boy were we in for a surprise! We didn’t make it 20 metres from the cabin before there was a big crash erupting in a cloud of powder. We continued this way for the entire trip down, all 3 hours and 15 minutes of it. Both of us were actually extremely relieved to have made it out alive and relatively unharmed. As I’m sitting here writing I can feel the bruises slowly spreading across my body, and I know when I wake up tomorrow I will be able to feel many, many muscles that I didn’t know I had! You may think that crashing into powder isn’t that bad, and you’re right, it’s not. It’s actually lots of fun and definitely not painful. However when that powder is covering up trees, stumps, rocks and creeks, the situation changes significantly. For anyone watching our adventure from a birds eye view, they would have seen a short set of tracks followed by a huge crater, followed by some floundering in the bushes or sinking through the snow and then another set of short tracks. This pattern continued the whole way down the mountain with some amazing crashes. A common one was crashing into trees followed by a huge dump of snow falling off the trees onto us and down our jackets. Another great one that wasn’t so much a crash as more just a funny bit of floundering in the snow bank as the iceberg that had previously been holding Sydney slowly turned to slush as it began sinking into the creek. All in all, I think we probably averaged one crash every 15 metres. Now this could be calculated and converted into a statistic via Poisson’s Probability formula, but regardless of the number, that equals a lot of crashes! And we still beat Chris and Hannis by 10 minutes! 1. BC is beautiful, and living in Ontario makes me appreciate it so much more when I come home than I ever did when I lived here. 4. 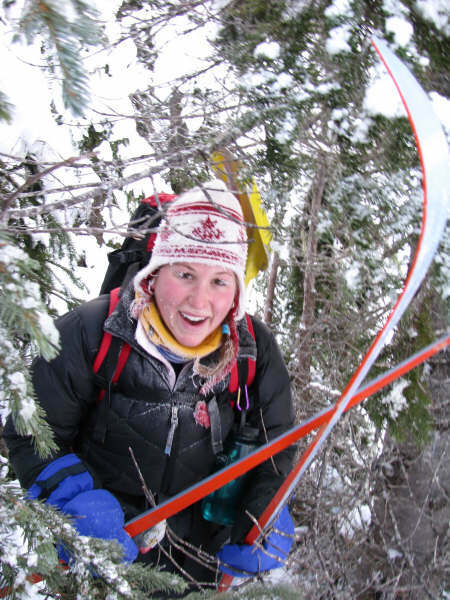 Bush-wacking and crashing for hours on end on old cross-country skis in waist deep powder can only be fun with your best friend behind you laughing (with you of course) every time you crash! 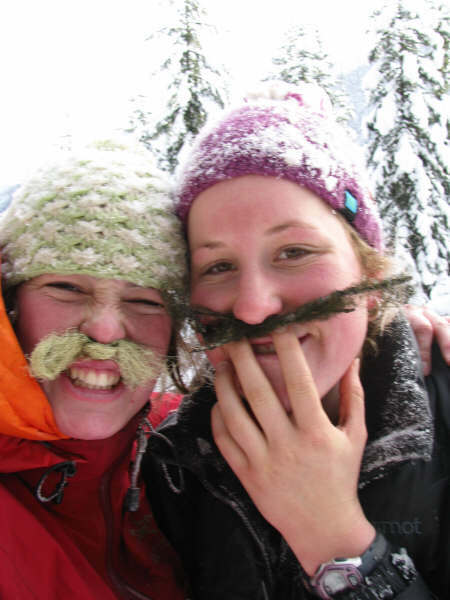 Photographer Syd (on left) and myself celebrate the start of the last forest section with Old Man’s Beard mustaches.